A path search problem is a computational problem where you have to find a path from point A to point B. In our case, we'll be mapping search problems to appropriate graphs, where the nodes represent all the possible states we can end up in and the edges representing all the possible paths that we have at our disposal. How do we convert a problem into a search problem? Let's say that you have to get through an enormous maze. This maze is so big that it would take hours to find the goal manually. Additionally, once you finish the maze "by foot", you're supposed to finish another one. To make things significantly easier and less time consuming, we'll boil the maze down to a search problem, and come up with a solution that can be applied to any additional maze that we may encounter - as long as it follows the same rules/structure. 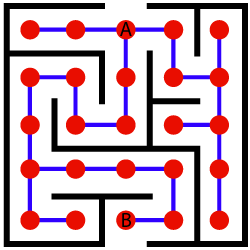 The maze problem can be solved by mapping the intersections to appropriate nodes (red dots), and the possible directions we can go to appropriate graph edges (blue lines). Naturally, we define the start and finish states as the intersections where we enter the maze (node A), and where we want to exit the maze (node B). Now that we have a finished graph, we can discuss algorithms for finding a path from state A to state B. In simple cases (like this one), where the generated graph consists of a small number of nodes and edges, BFS, DFS and Dijkstra would suffice. However, in a real-life scenario, because we are dealing with problems of enormous combinatorial complexity, we know we will have to deal with an enormous amount of nodes and edges. For example, there are many states a Rubik's cube can be in, which is why solving it is so difficult. Therefore, we have to use an algorithm that is, in a sense, guided. That is where an informed search algorithm arises, A*. Informed Search signifies that the algorithm has extra information, to begin with. For example, an uninformed search problem algorithm would be finding a path from home to work completely blind. On the flip-side, an informed search problem algorithm would be finding a path from home to work with the aid of your sight (seeing what path brings you closer to your destination) or a map (knowing exactly how far away every single point is from your destination). A* only performs a step if it seems promising and reasonable, according to its functions, unlike other graph-traversal algorithms. It runs towards the goal and doesn't consider any non-optimal steps if it doesn't have to consider them. This makes A* very useful for artificially intelligent systems - especially in Machine Learning and game development since these systems replicate real-world scenarios. If you'd like to read more about graph-traversal algorithms, their applications and differences, we've got them covered! A* is based on using heuristic methods to achieve optimality and completeness, and is a variant of the best-first algorithm. When a search algorithm has the property of optimality, it means it is guaranteed to find the best possible solution, in our case the shortest path to the finish state. When a search algorithm has the property of completeness, it means that if a solution to a given problem exists, the algorithm is guaranteed to find it. Each time A* enters a state, it calculates the cost, f(n) (n being the neighboring node), to travel to all of the neighboring nodes, and then enters the node with the lowest value of f(n). g(n) being the value of the shortest path from the start node to node n, and h(n) being a heuristic approximation of the node's value. For us to be able to reconstruct any path, we need to mark every node with the relative that has the optimal f(n) value. This also means that if we revisit certain nodes, we'll have to update their most optimal relatives as well. More on that later. The efficiency of A* is highly dependent on the heuristic value h(n), and depending on the type of problem, we may need to use a different heuristic function for it to find the optimal solution. Construction of such functions is no easy task and is one of the fundamental problems of AI. The two fundamental properties a heuristic function can have are admissibility and consistency. A given heuristic function h(n) is admissible if it never overestimates the real distance between n and the goal node. h*(n) being the real distance between n and the goal node. However, if the function does overestimate the real distance, but never by more than d, we can safely say that the solution that the function produces is of accuracy d (i.e. it doesn't overestimate the shortest path from start to finish by more than d). c(n,m) being the distance between nodes n and m. Additionally, if h(n) is consistent, then we know the optimal path to any node that has been already inspected. This means that this function is optimal. Theorem: If a heuristic function is consistent, then it is also admissible. The induction parameter N will be the number of nodes between node n and the finish node s on the shortest path between the two. We hypothesize that the given rule is true for every N < k.
This is a direct implementation of A* on a graph structure. The heuristic function is defined as 1 for all nodes for the sake of simplicity and brevity. 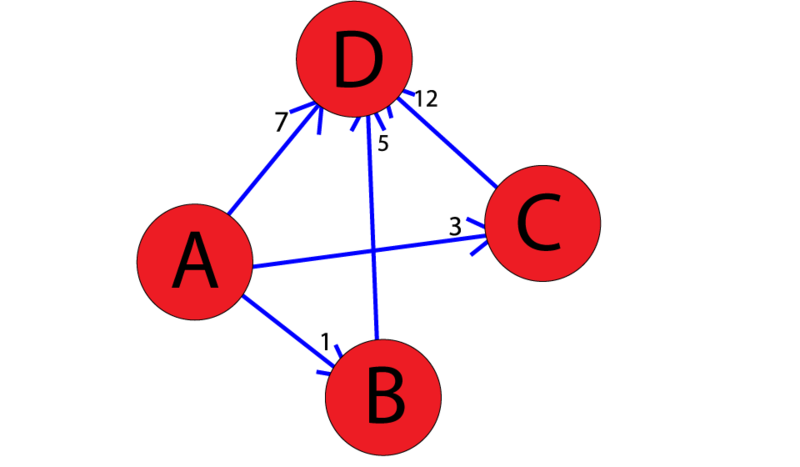 The graph is represented with an adjacency list, where the keys represent graph nodes, and the values contain a list of edges with the the corresponding neighboring nodes. Thus, the optimal path from A to D, found using A*, is A->B->D. A* is a very powerful algorithm with almost unlimited potential. However, it is only as good as its heuristic function, which can be highly variable considering the nature of a problem. It has found applications in many software systems, from Machine Learning and Search Optimization to game development where NPC characters navigate through complex terrain and obstacles to reach the player.